The ls -l or ll command can be used to view the permission of files and directories. In this example, there is a file named myFile that has -rw-r--r-- permissions. There are three standard permissions in Linux. Read gives you permission to view the contents of a file, using commands such as cat and grep, and view the contents of a directory, using commands such as ls (list). Write gives you permission to modify the contents of a file, using an editor such as vi or nano. Execute gives you permission to run an executable file, such as a bash shell script. In the list of permissions, characters 2 through 4 are used for user, characters 5 through 7 are used for group, and characters 8 through 10 are used for other. 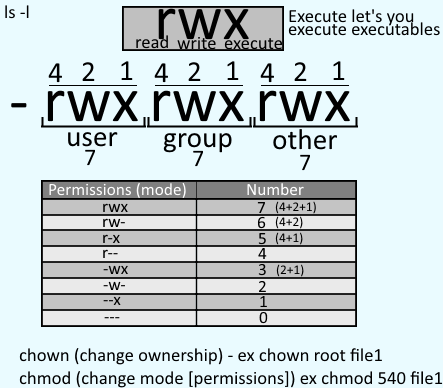 In the prior example, user has rw- (read write execute), group as rw- (read write), and other has r-x (read execute). JohnDoe is the user, meaning that JohnDoe can read, write, and execute myFile. Sales is the group, meaning that members of the group named Sales can read and write, but not execute myFile. If a persons that is a member of the Sales group attempts to execute myFile, a "permission denied" error will be displayed. Anyone who not JohnDoe and not a member of the group named Sales can read and execute, but not write to myFile. If anyone other than JohnDoe who is not a member of the Sales group attempts to write to myFile, a "permission denied" error will be displayed. If s or t is displayed, this means special permissions are being used. When a dot follows the standard permissions, this means that the file or directory is confined by an SELinux context.